This article was written By Colleen Wanglund on 25 Jul 2012, and is filed under Reviews. Also titled Rabbit Horror 3D, Tormented is directed (and co-written) by Takashi Shimizu, who made a huge splash both in Japan and internationally with his well-known J-horror series of Ju-On films. The film was shot in 3D but the screening I attended was in 2D. It premiered at the Venice International Film Festival in September 2011. Kiriko (Hikari Mitsushima) is a young woman living with her father Kohei (Teruyuki Kagawa), who creates children’s pop-up books, and her half-brother Daigo (Takeru Shibuya). Kiriko lost the ability to speak some years ago and currently works in the library of the school that Daigo attends. One afternoon, Daigo kills a rabbit that he believes is dying and, because of bullying over the incident, he stops going to school, instead staying hidden in the library all day with Kiriko. Daigo begins having strange hallucinations involving an amusement park and a rather large bunny that become more nightmarish as they progress. 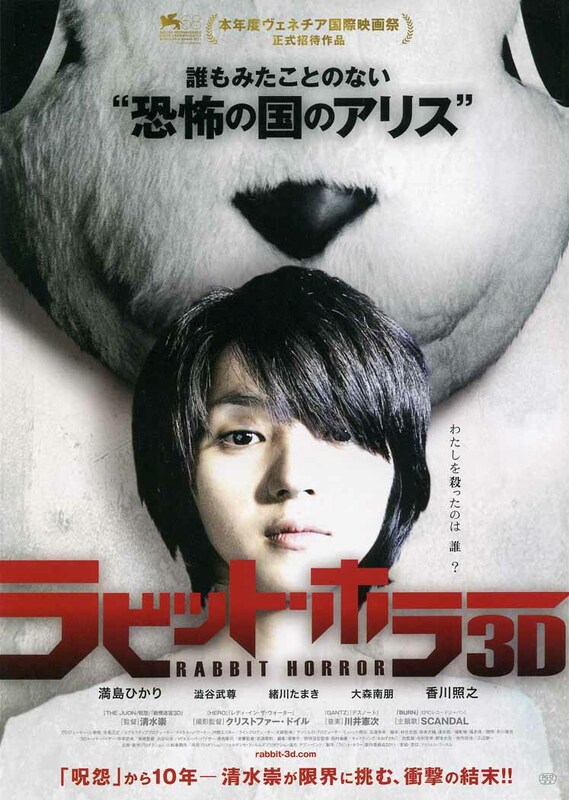 While at a 3D horror movie with Kiriko, Daigo grabs a stuffed bunny that comes out of the screen at him. Their father Kohei seems oblivious and withdrawn from what is happening to his children until Daigo ends up in a locked closet that the big bunny dragged him into. Kiriko tells her father that his dead second wife (and Daigo’s mother) Kyoko is coming. Now dad is on the phone to a doctor while whatever is happening to the children is spiraling out of control and Kiriko’s world falls apart. Tormented is not the type of horror film you would expect from Takashi Shimizu; however, it is an amazing film. There are multiple references to the story of the Little Mermaid, who gave up her voice to be human….at one point Kohei asks Kiriko what she traded her voice for. There is also a very cool and eerie visual that brings to mind Alice’s trip down the rabbit hole, and there is definitely a nod to Donnie Darko (2001) with the presence of a six-foot bunny. The character Kiriko reflects both the Little Mermaid and Alice, but this movie is not for children. While I had a few issues with visual effects that were too blatantly CG, overall, the film is beautifully shot by famed cinematographer Christopher Doyle (The Limits of Control (2009), Hero (2002), Dumplings (2006)). 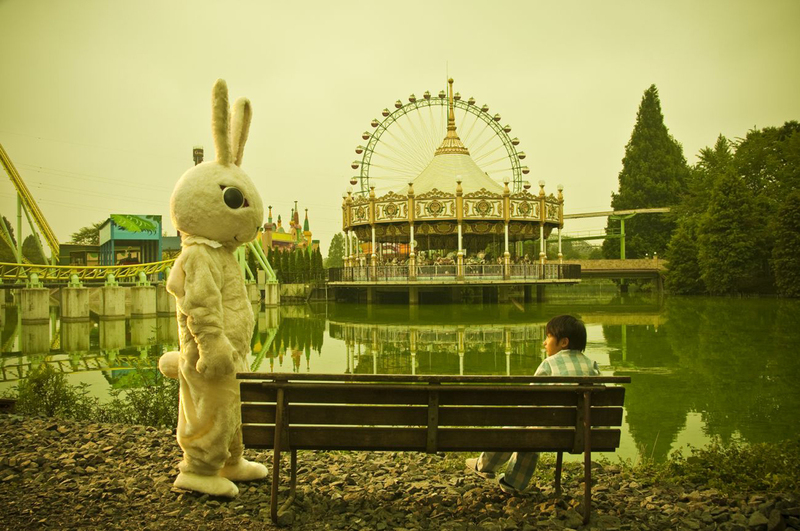 The scenes in the amusement park transition perfectly from happy and sunny to dark and foreboding before you can say “bunny”. There are a few moments in the film that are somewhat disorienting to the viewer, including scenes inside of an abandoned hospital and how a six-foot bunny can go from mildly creepy to super scary, but it all works well within the story. I also really liked the idea of the characters in the movie seeing a 3D movie (remember Tormented itself is a 3D movie) and how that movie invades their reality. Tormented reminded me of Kim Ji-woon’s A Tale of Two Sisters (2003), although it’s far more surreal, and because of that, I did guess at some parts of the story, but it is anything but predictable. Hikari Mitsushima is wonderful as the tormented teen that has lost her ability to speak and Takeru Shibuya does very well playing the ten-year-old boy who the hallucinations seem to fixate on. Shimizu and Doyle have created a disturbing but entertaining film that I personally enjoyed. However, if you’re looking for the long-haired ghosts of previous Shimizu flicks, you will be disappointed. Tormented was screened during the New York Asian Film Festival (in 2D, not the 3D it was filmed in) and as part of the Japan Society’s film festival Japan Cuts; the American distribution rights have been acquired by Wellgo USA.